This is an extremely valuable picture of Dr. Wu’s Daoist Aunt, Cheng Yu Li, the younger sister of Dr. Wu’s teacher, Master Du Xin Lin. She is currently 140 years old (1866-Present). Her longevity is a direct result of 133 years of persistent practice. 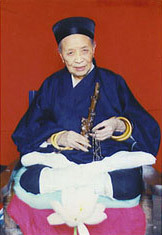 Master Wu took me to visit her on Jan. 2, 2003. During this meeting; she emphasized the importance of the “Five Centers Facing Heaven”. She is living proof of this testimony. Is there any difference between Five Centers Facing Heaven Qi Gong and other Qi Gong practices? Five Centers Facing Heaven is a rare and secret practice from the Dragon Gate and Wu Dang schools of Daoism. It is a type of Qi Gong, which focuses on the development of direct communication between the human being and nature by way of Qi. To practice this special Five Centers Qi Gong is to increase one’s longevity, deter and avoid most disease and maintain and continue to improve the physical condition. In one of the most important books from the Daoist Canon titled “Dao Zang” are accurately recorded testimonies written by Five Centers practitioners throughout it’s history, all of which support these claims. In addition, daily practice of the Five Centers can help one avoid disasters, be large or small, decreasing the rate of unexpected dangers. It is said, “The essence of Heaven and Earth produce the human beings body.” In your last life, this life and your future life, you should meet face to face with plenty of troubles and disasters because of inherent natural forces as well as the interaction of the human condition. But this type of Qi Gong can help you directly affect and change the direction and outcome of such inevitable occurrences. 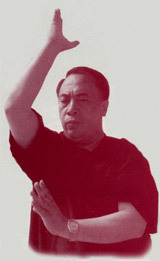 Other types of Qi Gong do not possess the strength, power and function, as does the Five Centers Facing Heaven. This is proven by the historical records of the human being and of course Dr. Wu’s Daoist Aunt who is currently 140 years of age. This is the best proof of all. Dr. Baolin Wu, OMD., L.Ac is a Daoist master form the White Cloud Monastery in Beijing, which for almost a thousand years has been one of the most respected centers in China for the practice of Daoist philosophy and medicine. While Dr. Wu is a recognized authority on traditional Chinese medicine, acupuncture, and herbal science, what sets him apart is his advanced expertise in Qi Gong. Note: For every "Dr. Wu" appearance on this website and elsewhere, it refers to "Dr. Wu, OMD., L.Ac".